Record your activities with a lightweight, flexible digital diary tool. Keeping a journal, even irregularly, can have many benefits. It's not only therapeutic and cathartic, it's also a good record of where you are and where you've been. It can help show your progress in life and remind you of what you've done right and what you've done wrong. No matter what your reasons are for keeping a journal or a diary, there are a variety of ways in which to do that. You could go old school and use pen and paper. You could use a web-based application. Or you could turn to the humble text file. Another option is to use a dedicated journaling application. 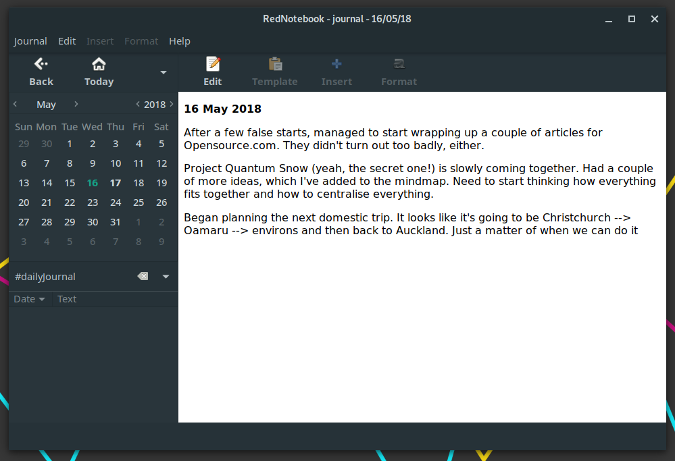 There are several very flexible and very useful journaling tools for the Linux desktop. Let's take a look at three of them. Of the three journaling applications described here, RedNotebook is the most flexible. Much of that flexibility comes from its templates. Those templates let you record personal thoughts or meeting minutes, plan a journey, or log a phone call. You can also edit existing templates or create your own. You format your journal entries using markup that's very much like Markdown. You can also add tags to your journal entries to make them easier to find. Just click or type a tag in the left pane of the application, and a list of corresponding journal entries appears in the right pane. On top of that, you can export all or some or just one of your journal entries to plain text, HTML, LaTeX, or PDF. Before you do that, you can get an idea of how an entry will look as a PDF or HTML file by clicking the Preview button on the toolbar. Overall, RedNotebook is an easy to use, yet flexible application. It does take a bit of getting used to, but once you do, it's a useful tool. 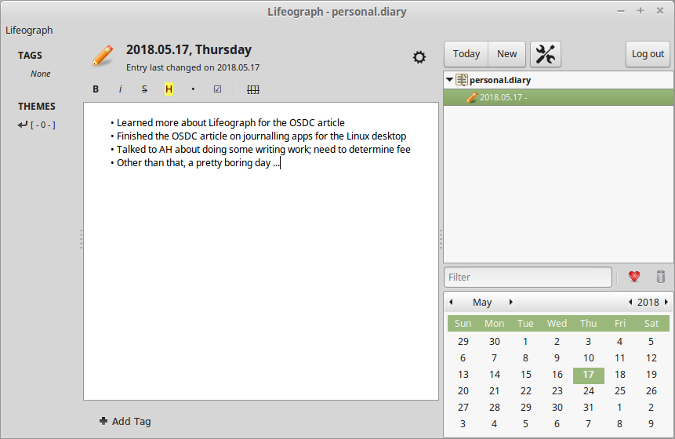 Lifeograph has a similar look and feel to RedNotebook. It doesn't have as many features, but Lifeograph gets the job done. The application makes journaling easy by keeping things simple and uncluttered. You have a large area in which to write, and you can add some basic formatting to your journal entries. That includes the usual bold and italics, along with bullets and highlighting. You can add tags to your journal entries to better organize and find them. Lifeograph has a pair of features I find especially useful. First, you can create multiple journals—for example, a work journal and a personal journal. Second is the ability to password protect your journals. While the website states that Lifeograph uses "real encryption," there are no details about what that is. Still, setting a password will keep most snoopers at bay. Almanah Diary is another very simple journaling tool. But don't let its lack of features put you off. It's simple, but it gets the job done. How simple? It's pretty much an area for entering your journal entries and a calendar. You can do a bit more than that—like adding some basic formatting (bold, italics, and underline) and convert text to a hyperlink. Almanah also enables you to encrypt your journal. While there is a feature to import plaintext files into the application, I couldn't get it working. 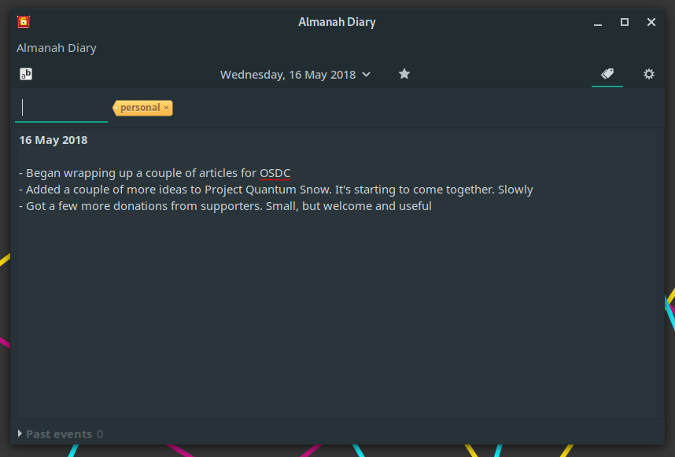 Still, if you like your software simple and need a quick and dirty journal, then Almanah Diary is worth a look. You don't have to go GUI if you don't want to. The command line is a great option for keeping a journal. One that I've tried and liked is jrnl. Or you can use this solution, which uses a command line alias to format and save your journal entries into a text file. Do you have a favorite journaling application? Feel free to share it by leaving a comment. Which is great if you use Emacs and org-mode (which I do). Of course, for those Emacs users who haven't embraced org-mode there are a few journaling modes out there. You didn't mention MyNotex. It's the best but for some reason the author never bothered to get it on a repo, as far as I know. https://sites.google.com/site/mynotex/ It behaves more like an actual notebook(s) but still retains the select by date ability that I like from RedNotebook. It's written in pascal and I came extremely close to compiling from source for Mac years ago, but the encryption options are what caused me to give up trying. What a great article. I had no idea there were applications like this. Hi Scott, thanks for your post. I also use (Spac)emacs and org-mode but wanted an independent app for keeping my records. I'm trying RedNotebook.